Samsung launched the Galaxy A7, its slimmest smartphone yet, in India over the weekend, and we had a chance to get our hands on it during the launch event in Bangkok on Monday. The Samsung Galaxy A7 belongs to the new Galaxy A-series of smartphones, which, with their metal unibodies, are part of the South Korean consumer electronics giant's attempt to distance itself from the all-plastic designs it has become notorious for. Samsung started along this path with the Galaxy Alpha, which launched in India in September 2014. Priced at Rs. 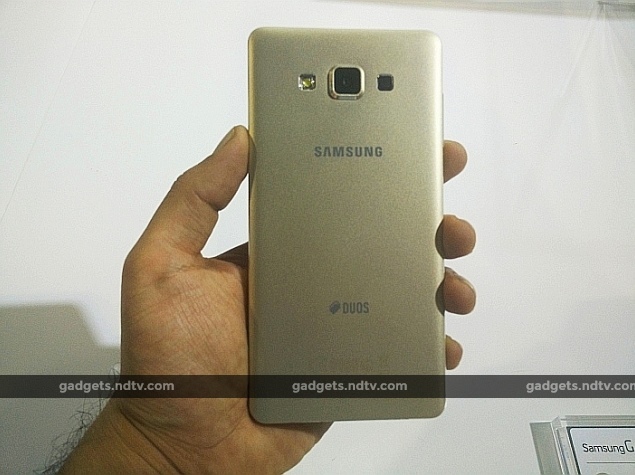 30,499, the Galaxy A7 is significantly less expensive than the Samsung Galaxy Alpha was at Rs. 39,990 - despite offering better specifications in some ways. The Alpha's price has dropped significantly since launch, however. Apart from a slower octa-core processor, the Galaxy A7 features higher-resolution front and rear cameras, a full-HD screen instead of HD, and storage expandability via microSD card. 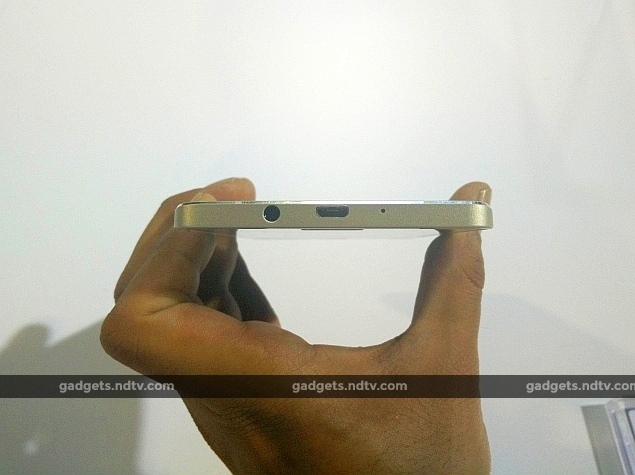 It comes with 16GB of built-in storage, whereas the Galaxy Alpha has 32GB but no microSD card slot. 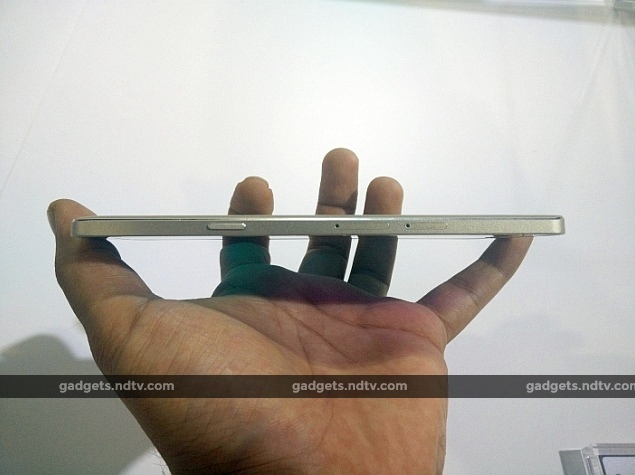 The Galaxy A7 has a non-removable 2600mAh battery which is much larger than the Galaxy Alpha's 1860mAh power pack. The Galaxy A7 has a larger screen at 5.5-inches compared to the Galaxy Alpha's 4.7-inch one, though of course unless media consumption is one of the primary usage cases for potential buyers they would probably be better served with a more manageably sized device. As we stated before, Samsung's newest Galaxy A-series smartphone is also its slimmest smartphone yet, with a thickness of 6.3mm. A thin, tall phone, the gold variant of the Galaxy A7 has a shiny gold-dust finish on its rear, and a slightly less shiny front panel that's patterned and covered in glass that goes right up to the edges. The rear panel features a protruding camera lens, flanked by the LED flash and the speaker - a placement that doesn't affect the sound output too much when the phone is placed on a hard surface. Speaker volume was a little underwhelming, though sound quality did not appear to be greatly distorted at maximum volume. On either side of Samsung's trademark oblong physical Home button are the capacitive backlit Back and Recents buttons that stay unlit and invisible until touched. The Galaxy A7's microSD and SIM card slots are on its right side, along with the power button, and the volume rocker is on the left. The Micro-USB port and 3.5mm audio jack are on the bottom. Overall, Samsung appears to have done a solid job with the device's build quality. The phone feels deceptively light for its metal-rimmed build, though it does weigh in at a relatively healthy 141 grams. As with most phones with 5.5-inch displays, one-handed operation is a bit of a stretch and largish hands would be needed to reach the notification shade on top without shuffling the phone. The screen on the Galaxy A7 is a Super Amoled panel, standard for Samsung's medium-to-high-end smartphones, and has excellent viewing angles in addition to the colour vibrancy this display type has become known for. Unlike most other Super AMOLED screens in Samsung's lineup however, the Galaxy A7's display - even at full brightness - is not as bright as we've come to expect. It is still perfectly acceptable and we had no problems in a brightly lit room. We were unable to test legibility under sunlight, however. The touch response was fine, and we had no complaints after spending some time typing and playing games. In our short time with the Samsung Galaxy A7, we were unable to put it through any synthetic performance benchmarks, but the phone showed no lag when we flipped through its interface and did not stutter while loading apps or in Angry Birds Star Wars II and Shadow Blade. The Galaxy A7 uses Samsung's familiar TouchWiz UI running on top of Android 4.4 KitKat with no word yet on a Lollipop upgrade. The Galaxy A7's 13-megapixel rear camera seemed to do a decent job, though we only saw output on the smartphone's own screen. There was almost no noise even in photos taken in dim environments. However, Samsung's noise-reduction algorithms do seem to be a bit excessive, with some of the finer details being wiped out. The camera interface is simplistic, though it allows a decent amount of customisation and lets you choose your own shortcuts from a variety of functions. The front-facing 5-megapixel camera also did a decent job, and the phone has some selfie-centric software features: Ultra Wide Shot and Auto Selfie. While we'd hesitate to make a judgement based on first impressions alone, Samsung seems to have done a decent job overall with the Galaxy A7. We would have hoped for some more power under the hood at this price. Then again with a slim form factor and a metal unibody, some trade-offs were to be expected. Stay tuned for our detailed review of the Samsung Galaxy A7 for our definitive verdict. Disclosure: Samsung sponsored the correspondent's flights and hotel for the event in Bangkok. product We go hands-on with Samsung's latest Galaxy A-series smartphone, the Galaxy A7, at the company's launch event in Bangkok, Thailand.